Buy Jan de Vries Emotional flower essence is a combination flower remedy in the UK from our online shop or directly from our independent Scottish store. Perfect for: those going through a difficult divorce or break-up; those grieving the loss of a family member, friend or pet; people who are struggling to move through the natural grieving process; empty-nest syndrome; emotional burnout; feeling broken-hearted. Water Violet, Sweet Chestnut, Willow, Walnut, Honeysuckle, Hawthorn and Borage, with Bach Emergency Combination (Star of Bethlehem, Impatiens, Cherry Plum, Clematis, Rock Rose). Grape Alcohol (approx. 27% ABV). Where can you buy real Emotional Essence safely online? If you are wondering where you can buy Jan de Vries Emotional flower essence is a combination flower remedy safely online in the UK, then shop with us. 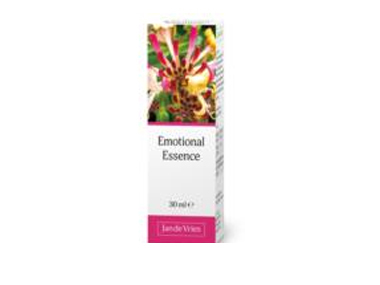 Emotional Essence - Jan de Vries Emotional flower essence is a combination flower remedy in Flower Essences and Herbal Remedies, Tinctures & Supplements.